What It’s About: Based on the true story of a groundbreaking 19th-century Korean painter. Jang Seung-up, who took the professional name “Oh-won,” lived at a time of great upheaval in South Korean culture. Reformers and traditionalists butted heads about the role of the monarchy, variously supported by Chinese and Japanese interventions, while the rise of Christianity also invited armed suppression. In this troubled time, Jang Seung-up managed to become trained as a painter despite the fact that he was not of noble birth. He rose to the top echelon of artists with his breathtaking imitations of Chinese styles, then forged his own identity before eventually disappearing without a trace. This film does a particularly good job of dramatizing the suffocating cultural constraints of the class system operative in Korea at the time and illustrating their effect on Oh-won, who takes refuge in copious quantities of alcohol. The drink in turn damages his health, his relationships with a series of women, and his ability to capitalize on his success. At least within the conceits of the film, he seems to embody the strife of his nation at the time. The movie features beautifully filmed landscapes, artistic masterpieces, and a restrained soundtrack that alternates natural sounds, traditional Korean music, and deftly placed silences. In terms of pure cinematic quality, this is the best movie I have yet to review for the League; it’s also a gripping tragedy. Why Watch it Today? : The Arthur M. Sackler Museum at Harvard University, housing a renowned collection of Asian art, opened on this date in 1985 to decidedly mixed reviews. Proving that everything — even Harvard architecture — is evanescent and fleeting these days, the building is currently (less than 30 years later) closed, and its collections are in process of moving to a unified Harvard art museum, which is scheduled to open to the public in a few weeks (with, I’m sure, attendant mixed reviews of its new “Renzo Piano Building Workshop”-designed addition). Whether or not you are a fan of Asian art or modern architecture, this movie is worth seeing. 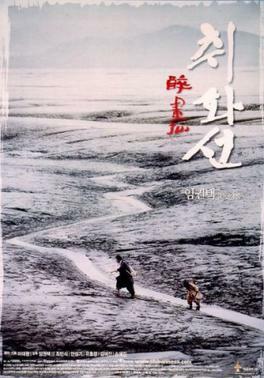 This entry was posted in "Based on a True Story", "Foreign Film", Addicition, Arthouse, Biopic, Coming of Age, Drama, Movie of the Day, Period Film, Romance, Tragedy and tagged alcoholism, art, Best Director (Cannes), class issues, Harvard, Im Kwon-taek, Jang Seung-up, Korea, nineteenth century, painter, Palme D'Or Nominee, peasant, prostitutes, Sackler Museum.